For other conflicts, see Anglo-Spanish War. The Anglo-Spanish War (1585–1604) was an intermittent conflict between the kingdoms of Spain and England that was never formally declared. 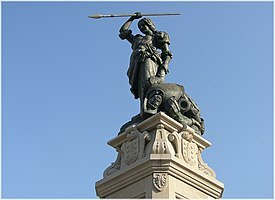 The war was punctuated by widely separated battles, and began with England's military expedition in 1585 to the Netherlands under the command of the Earl of Leicester in support of the resistance of the States General to Spanish Habsburg rule. In 1584, Philip signed the Treaty of Joinville with the Catholic League of France to stop the rise of Protestantism there. In the Spanish Netherlands, England had secretly supported the side of the Dutch Protestant United Provinces, who were fighting for independence from Spain. In 1584, the Prince of Orange had been assassinated, leaving a sense of alarm as well as a political vacuum. 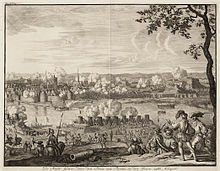 The following year was a further blow to the Dutch with the capture of Antwerp by Spanish forces led by Alexander Farnese, the Duke of Parma. The Dutch rebels sought help from England, which Elizabeth agreed to as she feared that a Spanish reconquest there would threaten England. The Treaty of Nonsuch was signed as a result – Elizabeth agreed to provide the Dutch with men, horses, and subsidies but she declined overall sovereignty. In return the Dutch handed over four Cautionary Towns which were garrisoned by English troops. Philip took this to be an open declaration of war against his rule in the Netherlands. The Anglo-Spanish War broke out in 1585, following the seizure of English merchant ships in Spanish harbors. In response the English privy council immediately authorised a campaign against the Spanish fishing industry in Newfoundland and off the Grand Banks. The campaign was a huge success, and subsequently led to England's first sustained activity in the Americas. In August, England joined the Eighty Years' War on the side of the Dutch Protestant United Provinces, who had declared their independence from Spain. Leicester soon realised how dire his situation was and then asked to be recalled. He resigned his post as Governor - his tenure was a military and political failure, and as a result he was financially ruined. After Leicester's departure, the Dutch elected the Prince of Orange's son Count Maurice of Nassau as the Stadtholder and Governor. At the same time Peregrine Bertie took over English forces in the Netherlands. English merchant privateers or corsairs known as Elizabeth's Sea dogs however enjoyed more qualified success. 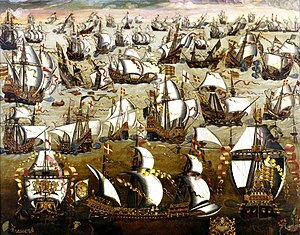 In the three years after the Spanish armada more than 300 prizes were taken from the Spanish with a declared total value of well over £400,000. English courtiers provided money for their own expeditions as well as others, and even Elizabeth herself would make investments. The Earl of Cumberland made a number of expeditions and a few did yield profit - his first being the Azores Voyage in 1589. Others failed however due to bad weather and his 1591 voyage ended in defeat with Spanish galleys off Berlengas. Cumberland with Sir Walter Raleigh and Martin Frobisher combined financial strength and force that led to the most successful English naval expedition of the war. Off Flores island in 1592 in a naval battle the English fleet captured a large rich Portuguese carrack, the Madre de Deus as well as having outwitted a Spanish fleet led by Alonso de Bazán. The expedition's reward equalled nearly half the size of the Kingdom of England's royal annual revenue and yielded Elizabeth a 20-fold return on her investment. These riches gave the English an excited enthusiasm to engage in this opulent commerce. Raleigh himself in 1595 went on an expedition to explore the Orinoco river in an attempt to find the mythical city of El Dorado in the process the English plundered the Spanish settlement of Trinidad. Raleigh however exaggerated the wealth there on his return to England. Supporting Raleigh with his expedition was another led by Amyas Preston and George Somers known as the Preston Somers expedition to South America notable for a daring overland assault that saw the capture of Caracas. Many of the expeditions were financed by famed London merchants, the most notable of these being John Watts. An expedition Watts financed to Portuguese Brazil led by James Lancaster saw the capture and plunder of Recife and Olinda - which was highly profitable for both. In response to English privateering against their merchantmen, the Spanish monarchy struck back with the Dunkirkers devastating English shipping and fishing in the largely undefended seas around England. By far the most successful English privateer was Christopher Newport who was backed financially by Watts. Newport set out in 1590 to raid the Spanish West Indies and in the ensuing fight saw the defeat of an armed Spanish convoy but Newport lost his right arm in the process. Despite this Newport continued the ventures - the blockade of Western Cuba in 1591 was the most successful English privateering venture made during the war. Both Drake and Hawkins died of disease on the later 1595–96 expedition against Puerto Rico, Panama, and other targets in the Spanish Main, a severe setback in which the English suffered heavy losses in soldiers and ships despite a number of minor military victories. The Crown instead of controlling and taxing its subjects, competed with them for private profit, a race it failed to win, as the great naval expeditions were on the whole unprofitable. The last of the great English naval expeditions took place in 1597, led by the Earl of Essex known as the Islands Voyage. The objective was to destroy the Spanish fleet and intercept a treasure fleet in the Azores. Neither was achieved and the expedition ended in failure, and Essex on his return was scolded by the Queen for not protecting the English coast. The new king of England, James I, was the Protestant son and successor to the Catholic Mary, Queen of Scots, whose execution had been a proximate cause of the war. James regarded himself as the peacemaker of Europe, and the ultimate aim of his idealistic foreign policy was the reunion of Christendom. Therefore, when James came to the English throne, his first order of business was to negotiate a peace with Philip III of Spain.